Conveniently located right in the heart of Glossop town centre on Henry Street, The Partingon Players Theatre is easily accessible by car, train and bus. The theatre entrance is situated opposite the main bus stop for Glossop Town Centre. Local buses serve Hyde, Ashton, Buxton and Stockport in addition to the surrounding villages. 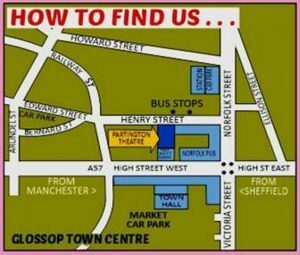 Glossop railway station is a 2 minute walk away from Henry Street. There is a regular service to Manchester Piccadilly, calling at Broadbottom, Hattersley, Guide Bridge and stations to Manchester. The last train currently runs around 10:30pm Monday to Saturday, 9:30pm on a Sunday. There is ample parking in Glossop town centre. Edward Street is the most convenient and is adjacent to Henry Street, less than 2 minutes walk away. Parking is free after 6pm. There is also a taxi rank on the station car park. Copyright © 2009 Partington Players. All Rights Reserved. Site design and build by Gravity Digital. Powered by WordPress.